A recent study conducted by University of Pennsylvania psychologists Elika Bergelson and Daniel Swingley may show that the first signs of language recognition in infants occur earlier than has initially been believed. The study tested language comprehension in 6- to 9-month old infants by recruiting caregivers to bring children to the lab to complete a set of two experiments. In the first, caregivers wore visors and repeated basic sentences like “Where is the apple?” while the researchers monitored the infants’ gaze through eye-tracking software. 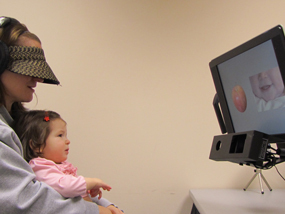 The infant was presented with two images while the eye-tracking software measured visual response. In the second experiment, the images on the screen were presented in context – for example, a number of different foods on a table or a human figure instead of just the part of the body that the caregiver stated. Photograph: A baby participates in the study of language acquisition. Courtesy of the University of Pennsylvania. kids are all geniuses. current educational systems inhibit creativity. children need to learn how to think, not what to think.